Jen sleeps much better when we eat dinner early. Lately that's been a snap but tonight after arriving home a little later than normal we had to have our dinner at 9:00 PM. It's just like when Jen was going into the office and we would regularly have dinner this late. Given the late start time I threw together dinner with a great attention to speed and not that much attention to quality. What an appropriate way to lead into the celebration of American independence. 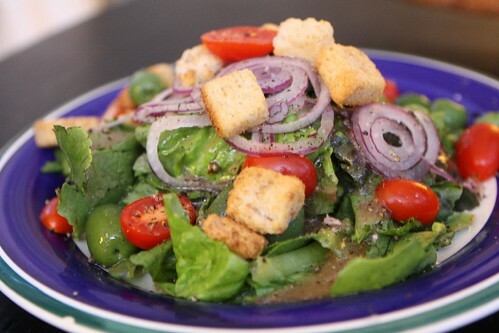 I started by making a Greek salad with Italian Castelvetrano olives. I used the remaining romaine and red leaf as well as croutons, Greek dressing, and tomatoes. For the main course I cooked up some rice with coconut flakes. I used the rice I'd used to weigh down the tart dough for Jen's birthday fruit tart, so it had a nice toasted nutty flavor to it. I cooked down some onion and the farm zucchini in a little olive oil then added this sauce of garlic, ginger, curry powder, cumin, salt, white pepper, and yogurt. 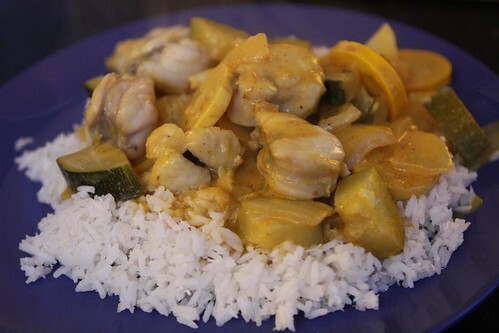 Right near the end I threw in some monkfish tail and served it up with the rice. Lately I enjoy having IPAs with my curries. After all, the "I" does stand for India. 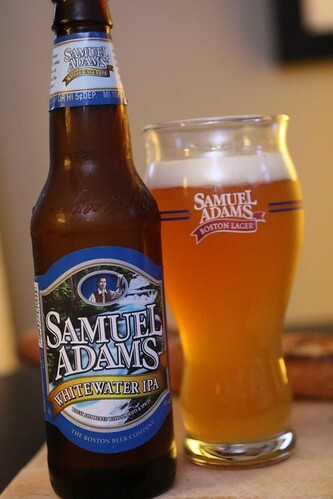 So I popped open the latest from the Samuel Adams Hopology 12-pack, this Whitewater IPA. This was a very nice, light, refreshing IPA with nice citrus notes. So far I've been very happy with this 12-pack. It makes me proud to be from Sam Adams territory. In honor of this celebration of foods from Italy, Greece, and India we watched the Tour de France which only celebrates riders from one of those nations. I'm not going to ruin the surprise by telling you which one.